The reason it has allot of power per litre is because it combusts 3 times in just 1 rotation, so you could say a single rotarie is the same as a 3 cilinder engine. But where the piston engine is calculated at displacement for every combustion chamber, the rotarie is only calculated for 1 combustion chamber. 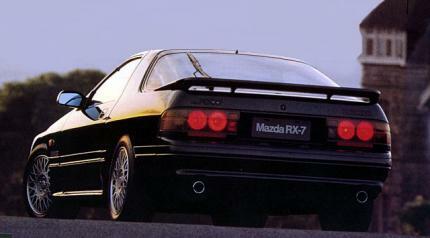 If you would see the displacement the same as with a piston engine, the RX7 would actually have a 3.9 litre engine. In the time a piston engine completes it's cycle a rotarie completes 4 combustion. So you could say the 1.3 litre twin rotarie is compareble to a 2.6 litre 4 cilinder piston engine. The 1986 and newer RX-7s all had a 1.3L engine displacement. The engine is 2 rotors, each rotor having a displacement of 654cc, which yields a total engine displacement of 1308cc or 1.3 Liters. Therefore, you should change the displacement figure to 1.3 Liters. You can check out the other RX-7 and the RX-8 that are already on this website to see that they are already listed at 1.3 Liters. That is the true prowess of the rotary; no other internal combustion engine can match the power per liter ratio. Aren't it 2 rotaries with 1.3L each? The displacement is actually 1.3L and not 2.6. Please know what you are talking about before you add cars.